Archabbot Lambert Reilly talked tonight at the second installment of the parish mission at St. John’s. His presentation covered a lot, and I can’t say as I remember it all. But he mentioned the true gift we have in embracing Jesus, as real on the altar in the host as he was at his birth. What an extreme gift we have in the Eucharist and the Holy Mass. I think it complimented Dr. Howell’s presentation last night at St. Charles very nicely. 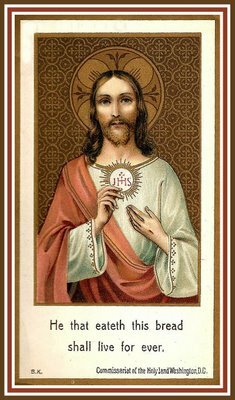 What’s necessary for Jesus to become present is a duly ordained priest (whether he spent the previous night in adoration for five hours or in a brothel), bread and wine (no matter the brand), and an approved Eucharistic prayer (the Canon or a short one). That’s it folks. And Jesus, the God of the Universe, becomes present to us–present to nourish us, strengthen us. And bring us into communion with him and the Church. We end up with peace. But we certainly don’t get peace fretting over the priest’s habits and other petty things that, in the long run, don’t matter as much. This is not to say that form and “smells and bells” don’t matter; they do, and there is theology behind it all. That’s why we use them: they do bring us to a more profound meeting with Christ. But it is to say that we ought not focus too much on “the way we want it,” and focus more on the profound gift God extends to us. God comes to us even if there is no organ, even if the altar is a card table, even if the priest spends his free time in sin. And THAT is something to be grateful for, and THAT is what we come for. This entry was posted in Eucharist, Priesthood, Reflections, Sacraments, Vocations. Bookmark the permalink. This is true yet sometimes when youth discover for the first time that a parent, a priest, a person that we've tried to teach them to be respectful of…fails big in an obvious way, then oftentimes the faith of that youth is shakin mightily. You and I can separate things in our minds and hearts and know better. Sometimes youth discover these things without our knowledge and sometimes are even fearful of talking it out and we never know why they left the Faith, so for adults it may be one thing, but to a youth, it could be another. No, it shouldn't matter and Christ is there. I think we just have to somehow help our children to understand as they are growing about these things better, but sometimes, it is plain difficult how to word this with them, if you see what I'm saying. For me…I like your post and I do agree. Thanks again, Mike..since we didn't get to this mission at St. John's. Do not worry Suzanne I still know the church is where Jesus is at. How true. I hadn't considered it from that point of view. I wonder what Fr. Archabbot would respond! But his presentation was clearly geared towards a certain crowd–a crowd who might find themselves at odds with some liturgical changes on the horizon or at odds with various clergy. Yes, I did figure that out too. I fully believe you know and love the Church and I am so happy for you.